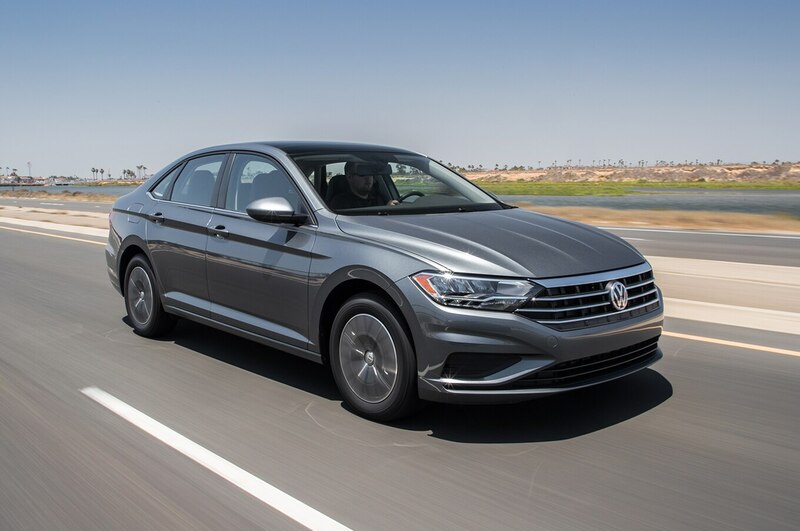 Home » Cars » Volkswagen » Jetta » 2019 Volkswagen Jetta SE First Test: A Worthy Civic Competitor? 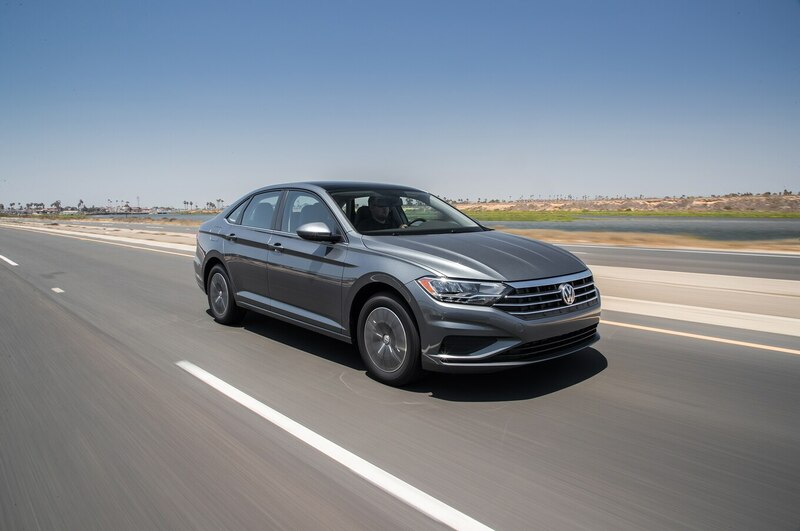 2019 Volkswagen Jetta SE First Test: A Worthy Civic Competitor? Have you seen the deals? Consumers who aren’t too particular can snag a $20,000–$25,000 USD compact sedan with staggeringly high incentives of up to $4,000 USD. 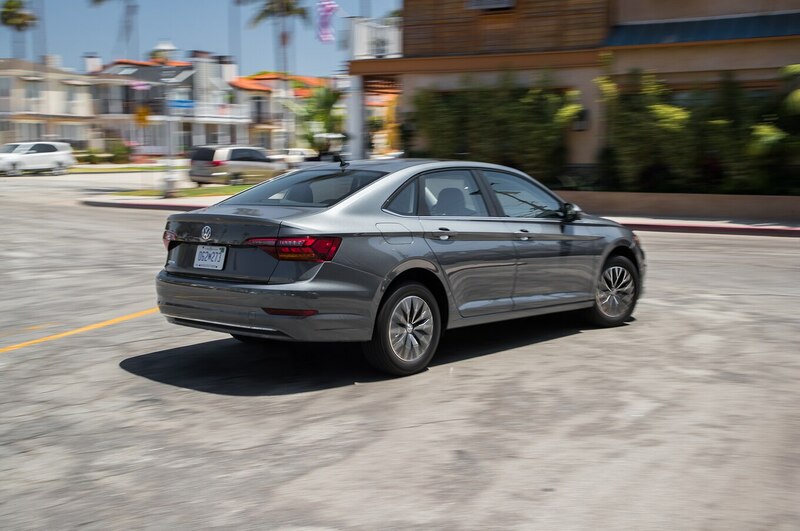 That’s the market the 2019 Volkswagen Jetta enters; the redesigned car competes against cars pretending they belong in a lower price class. 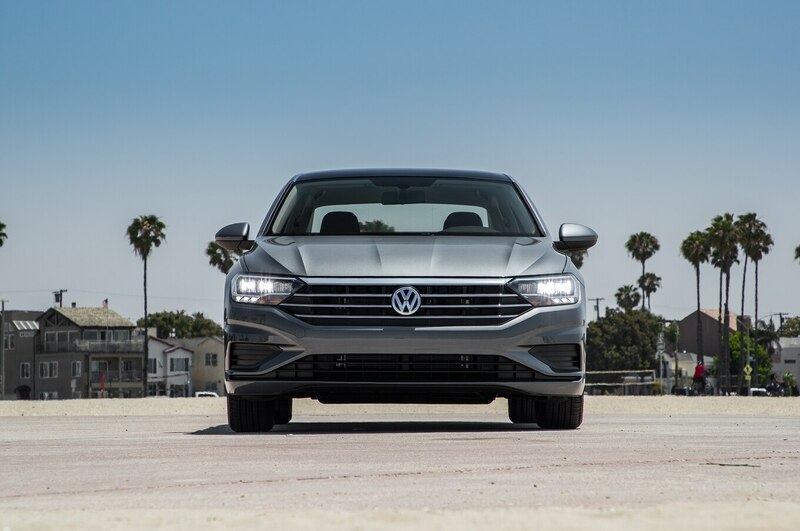 But after testing a $23,005 USD 2019 Jetta SE sedan, VW shouldn’t need to adopt similarly aggressive tactics, at least at first. 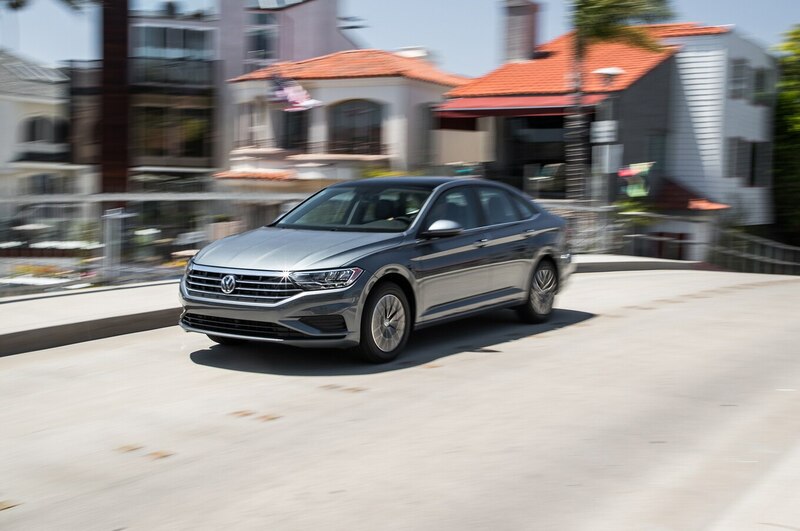 We drove Volkswagen’s most affordable and best-selling sedan on the track and in the real world to determine what the German car can offer against the segment leader, the Civic, as well as the rest of the class. Not every car with a down-payment-sized discount is worth driving. Every buyer’s situation is different, but sometimes it’s worth paying a little more for a better day-in, day-out experience. 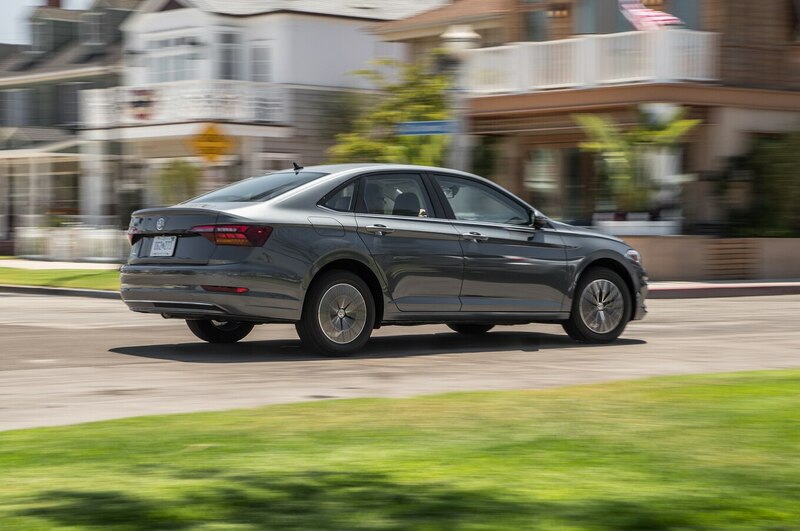 Those willing to give VW a chance will find the 2019 Jetta a decently well-rounded and very quick package. Yes, quick. 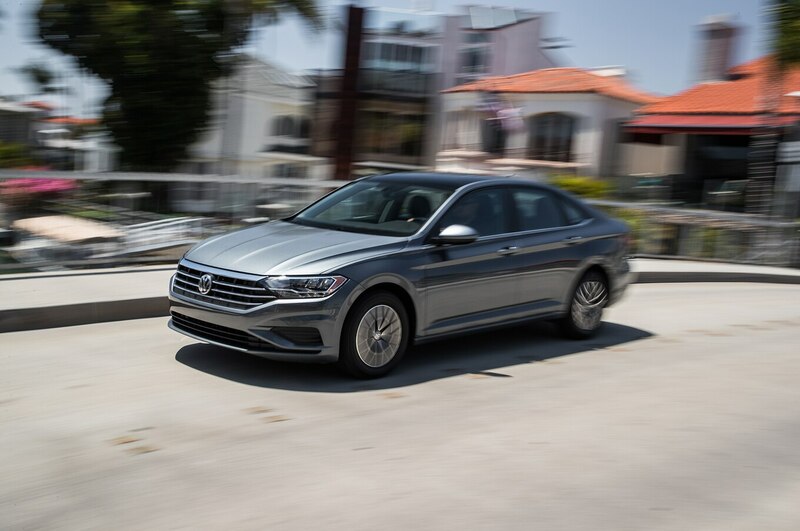 The 2019 Jetta SE would have smoked all seven cars in our comprehensive 2016 Big Test of compact sedans, a comparison a base-engine Civic won over the last-gen Jetta and five others. 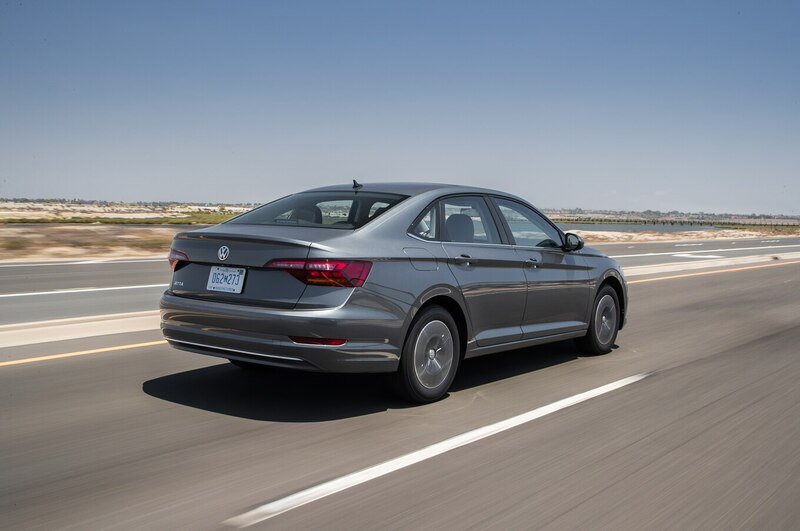 Although the outgoing Jetta offered 20 hp more on more expensive models, every 2019 Jetta with the 1.4-liter turbo-four is rated at 147 hp at 5,000 rpm and 184 lb-ft of torque at just 1,400 rpm. 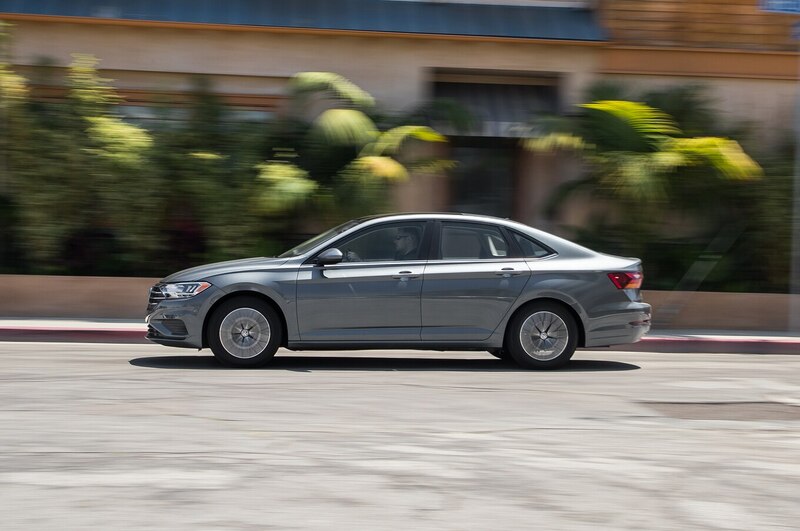 With a quick-shifting eight-speed automatic, the new Jetta hits 60 mph in just 7.6 seconds. That’s ahead of a 2.0-liter 2016 Civic sedan (8.6 seconds), 2016 Chevrolet Cruze sedan (8.2 seconds), 2.0-liter 2017 Hyundai Elantra sedan (8.9 seconds), and a slow-poke 2018 Toyota Corolla (9.9 seconds). 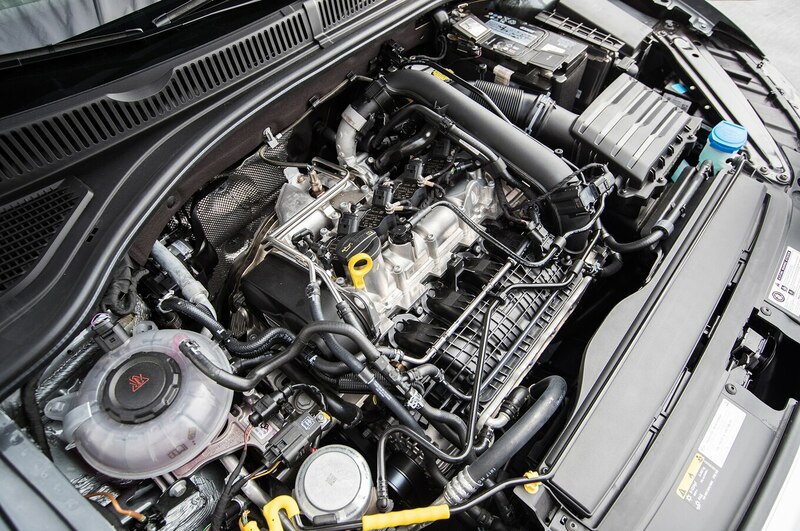 The Civic’s turbocharged engine option hits 60 in a quicker 6.8 seconds. The Jetta’s response to full throttle from a stop is a slight hesitation followed by more oomph than you might expect from a 147-hp car. For a compact car with EPA ratings of 30/40 mpg (7.8/5.9 L/100km) city/highway—good but a tiny bit below the Civic sedan—passing acceleration is responsive, too. 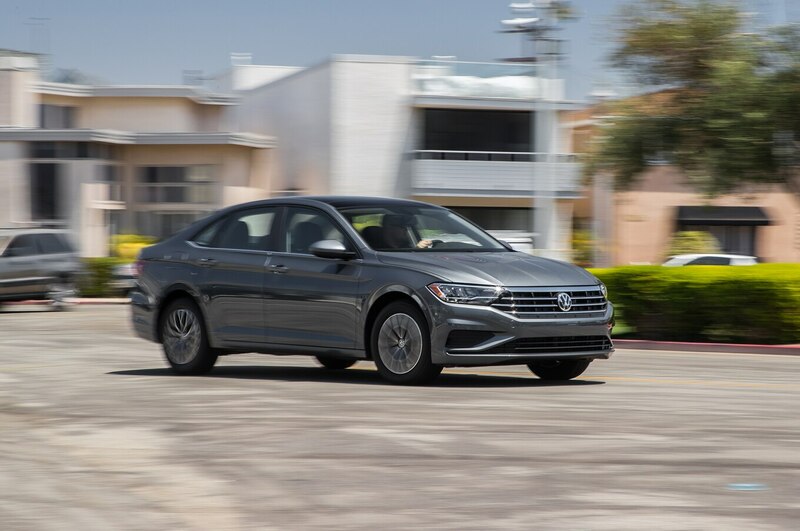 Where the 2019 Jetta didn’t excel was its 127-foot braking distance from 60 to 0 mph. That ties the base-engine Civic and is a few feet shorter than the Corolla, but the Civic 1.5T, Elantra, and Cruze all stop shorter. Road test editor Chris Walton liked the Jetta’s firm pedal and good initial bite but said, “It feels like these tires have no grip for the rest of the trip to 0 mph.” Our SE-trimmed tester wore 205/60R16 all-season Bridgestone Ecopia tires; the higher R-Line and SEL Premium trims come with larger 17-inch alloy wheels wrapped in 205/55R17 all-season rubber. Around town, the tires keep quiet unless you’re moving quickly around curves. 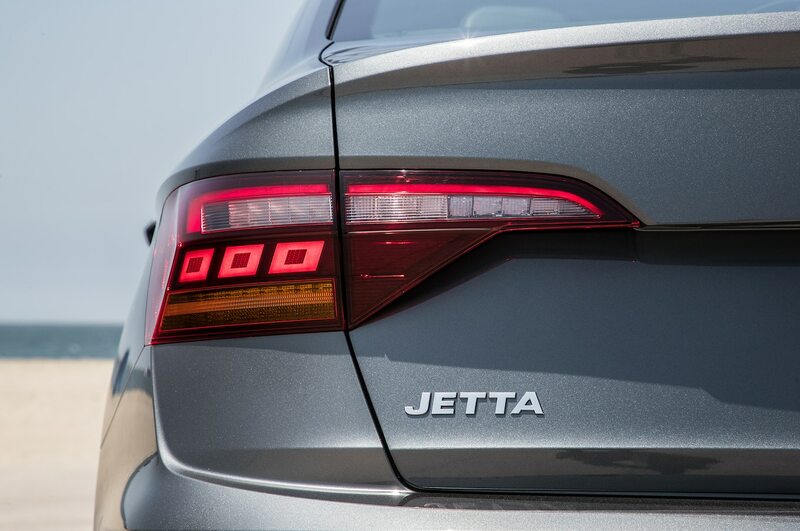 The Jetta can hold its own on a winding road, though the upcoming Jetta GLI model—with more power and a greater focus on sportiness—will likely be a better back-road companion. If your absolute top priority is getting a good deal with a warranty almost as long as the VW’s, consider the Hyundai Elantra, which placed third in our 2016 Big Test of compact sedans. 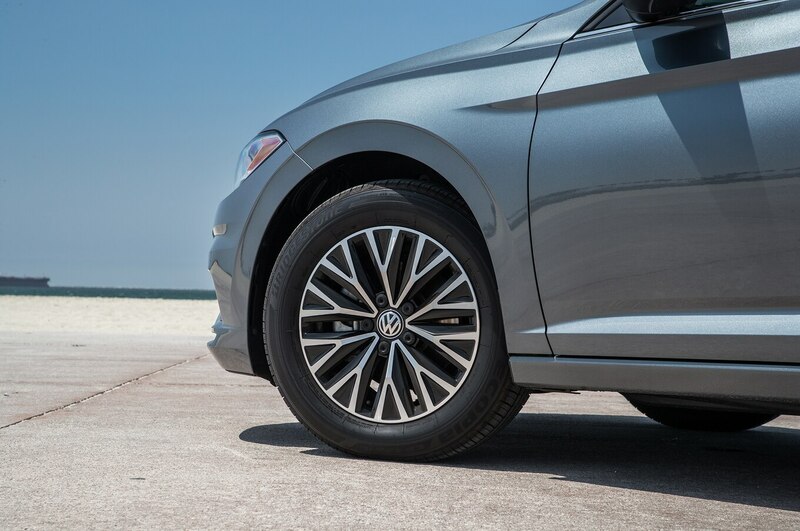 On a highway road trip, I found the suspension—which provides a comfortable ride most of the time—to be a little stiff over rough freeway expansion joints. 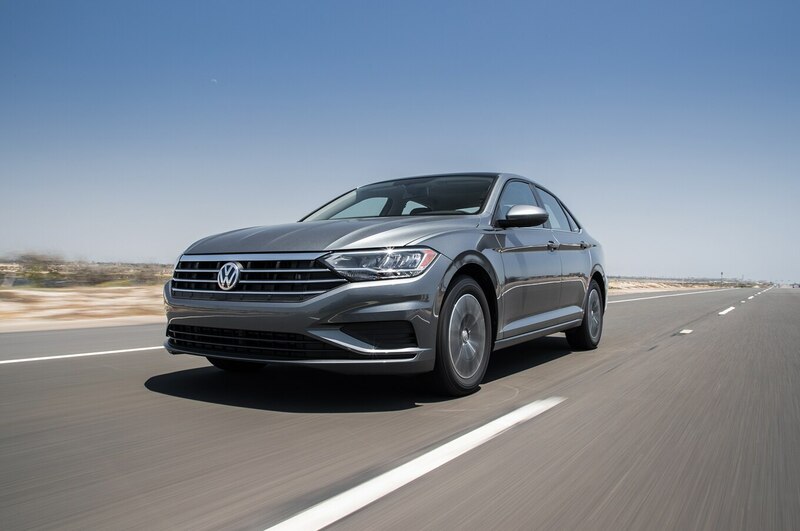 The Jetta also provides an acceptable amount of interior quietness for an inexpensive four-door, but the car won’t surprise you with “class-above” quietness. In traffic, the car’s eight-speed automatic is responsive. 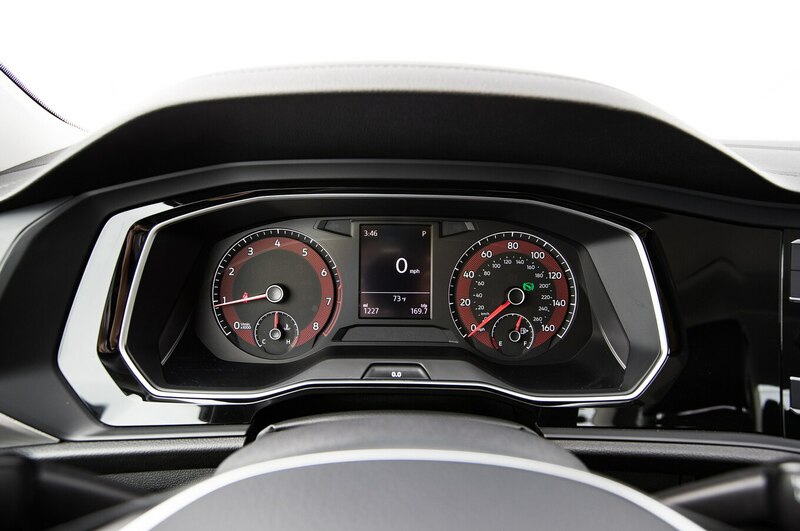 In fact, those with a more relaxed driving style might consider pressing the car’s Eco button for a smoother driving experience (the transmission also has a Sport mode). 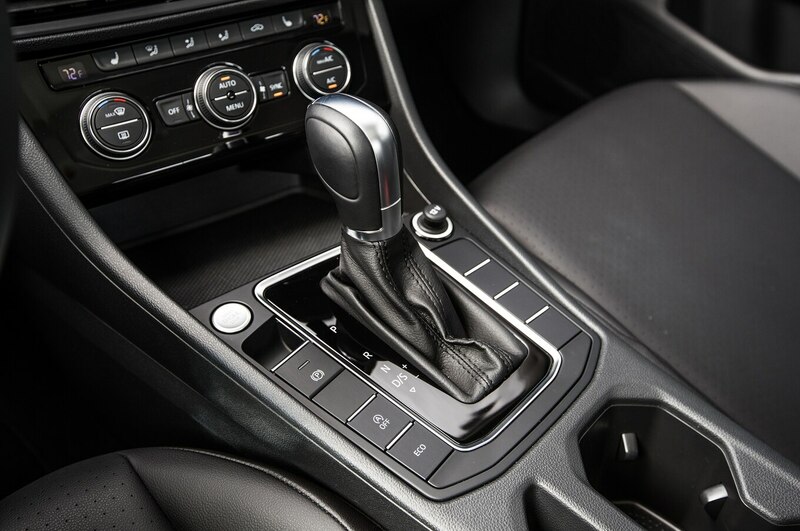 When it comes to smoothness, though, the eight-speed automatic is no CVT. Pull away from a stop sign with minimal to moderate throttle, and your head will bob as the car shifts—it’s subtle, but still something CVTs avoid. 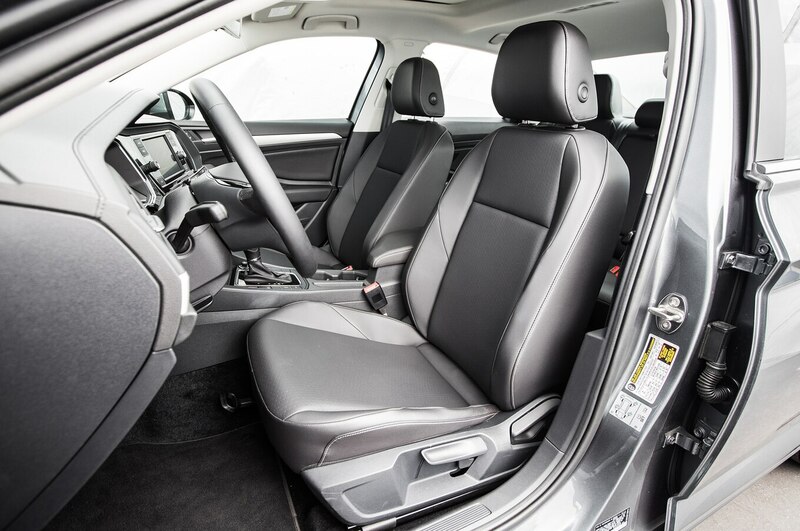 The 2019 Jetta gains back ground with its interior layout. Not so much the materials—which are a mix of hard- and soft-touch surfaces (the soft front center armrest is appreciated)—but the layout. 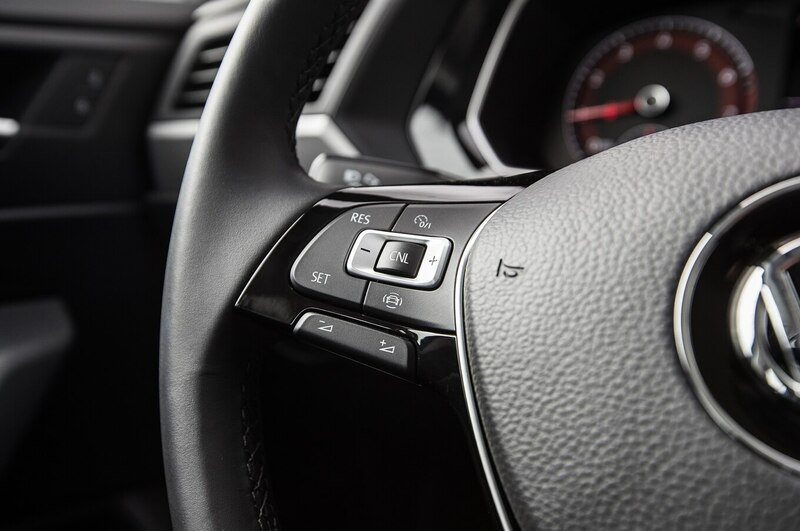 The touchscreen and controls are all tilted toward the driver for better visibility and access. 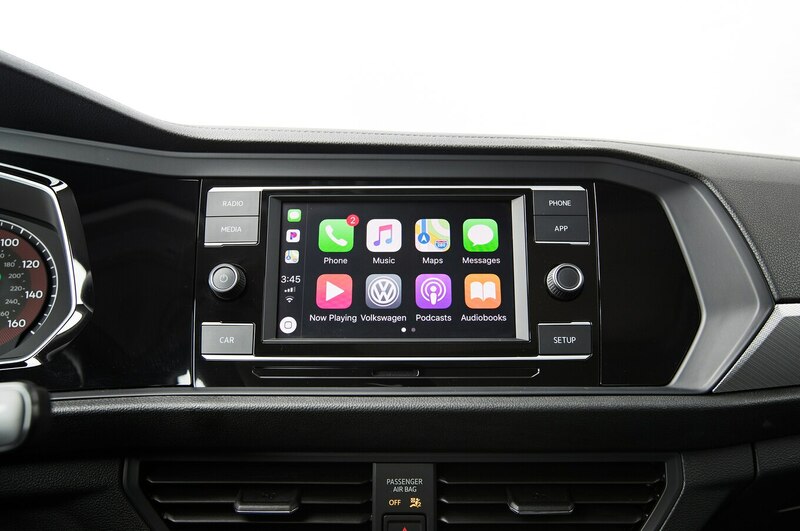 It’s an incredibly useful design touch that makes the most of the 6.5-inch touchscreen standard on the Jetta S, SE, and R-Line models; SEL variants get an 8.0-inch touchscreen. 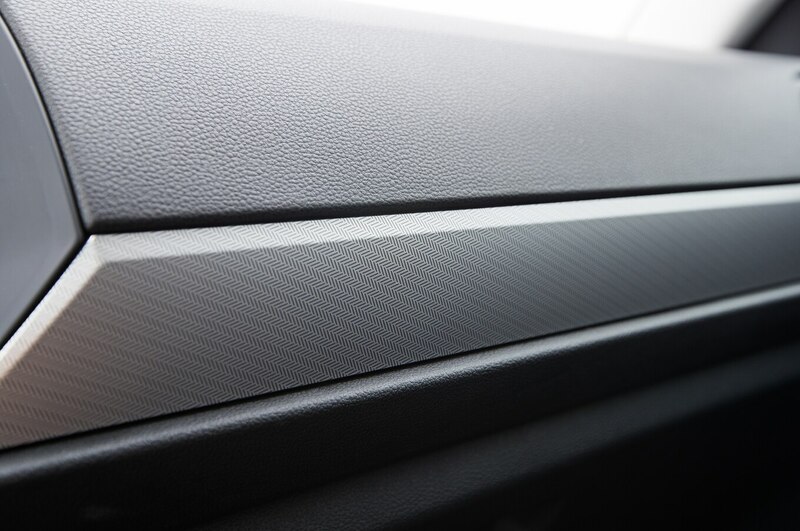 Below that screen and the central air vents are the HVAC controls that don’t feel particularly rich but are perfectly functional—again, the materials are class-appropriate but won’t give anyone the illusion the controls were ripped from an Audi. Below those HVAC controls, on the right side of the shift stalk for all Jetta 1.4Ts is a row of blank button placeholders; VW tells us they’ll remain empty until the GLI model arrives. 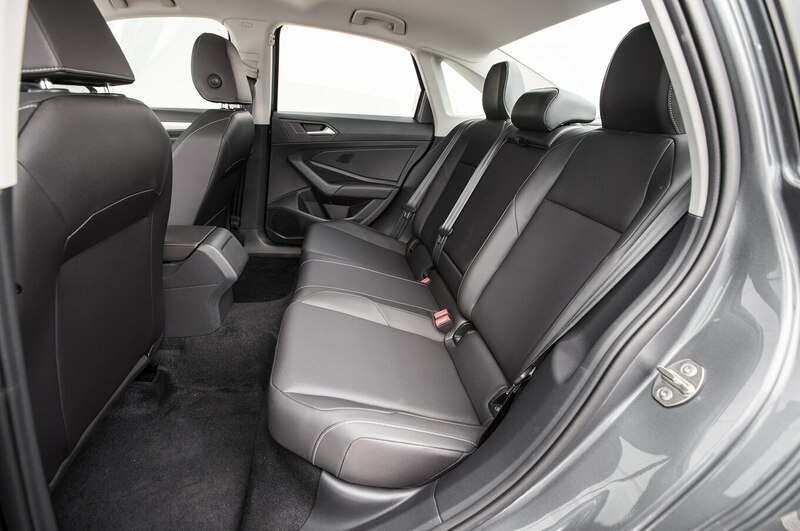 Our Jetta SE tester lacked rear-seat air vents, but it’s roomy and comfortable back there for outboard passengers. 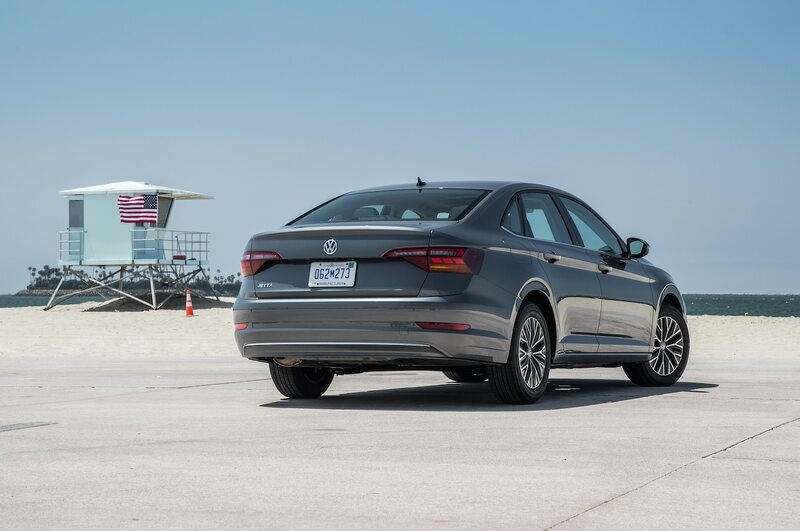 Almost every Jetta includes automatic emergency braking as standard (it’s part of a $450 USD package on the base S trim). Visibility is good all around, but we wish the outboard headrests weren’t hard-mounted into the back rests, and could fold down out of the way. 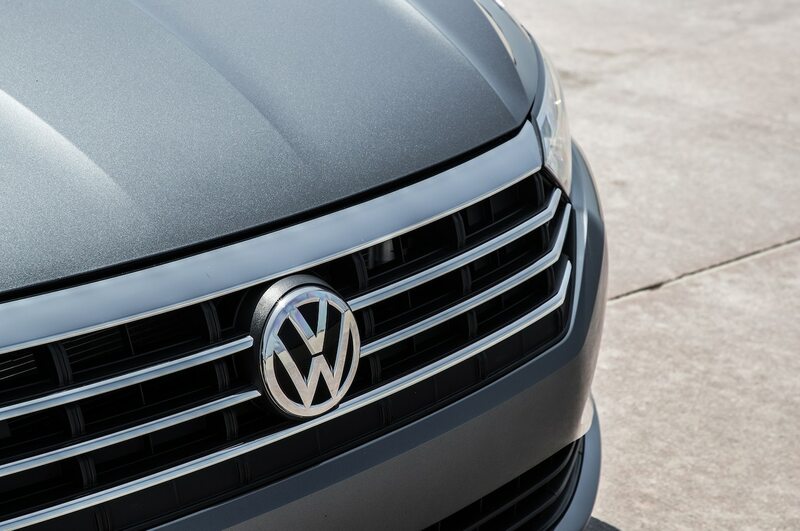 At the SE’s $23,005 USD price, Volkswagen throws in a bunch of content. 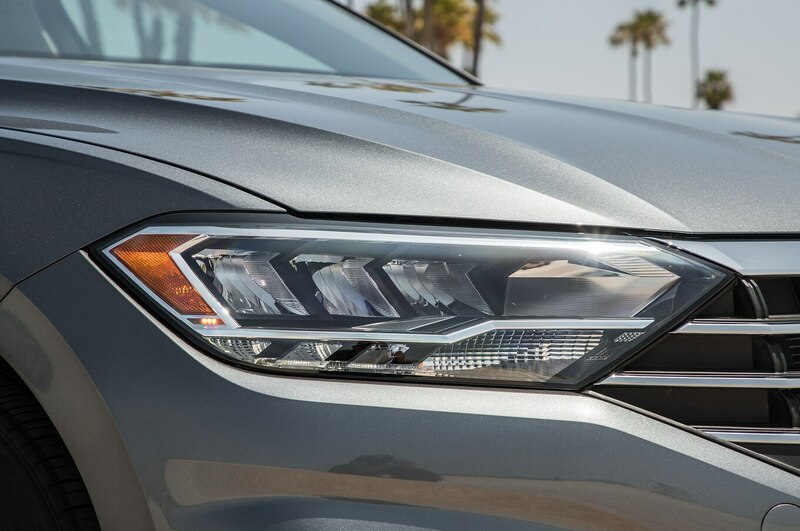 That trim includes automatic emergency braking, LED headlights, a large sunroof, Android Auto and Apple CarPlay on a 6.5-inch touchscreen, a proximity key that doesn’t require pushing a button to unlock the car (the most convenient version of this tech), heated front seats, and a peppy powertrain. 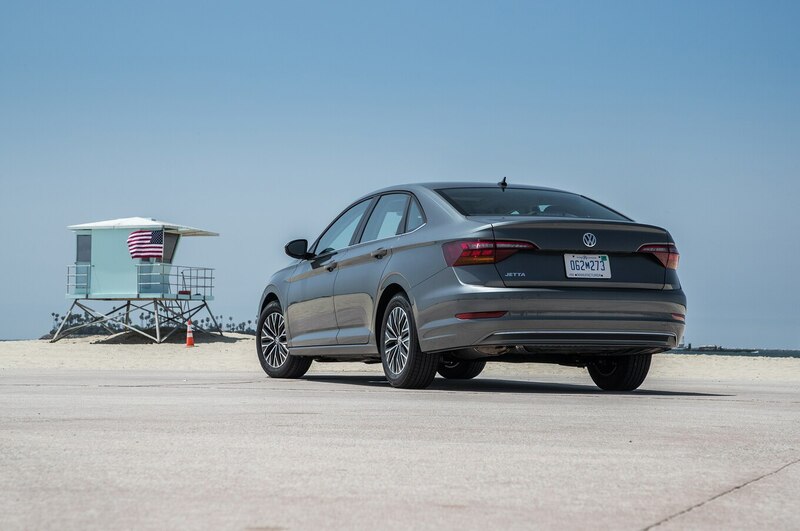 To assuage the skepticism of folks not convinced of Volkswagen reliability or reluctant to give the automaker a chance after its diesel scandal, the Jetta is covered by a class-leading 6-year/72,000-mile (116,000-km) basic warranty. It’s an impressive security blanket of a warranty, outdoing the also-laudable 5-year/60,000-mile (96,000-km) basic warranty from Hyundai and Kia. 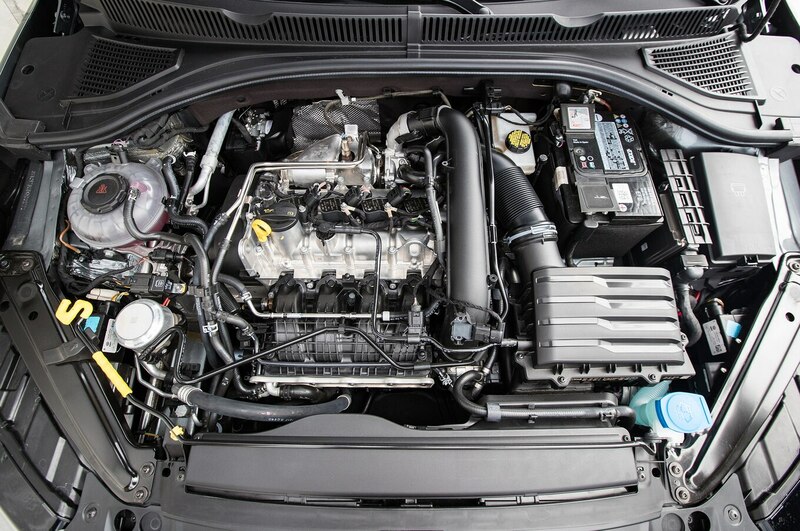 VW’s long basic warranty is exactly twice as long as what you’ll get from a Honda Civic. But the class-leading Civic is great. 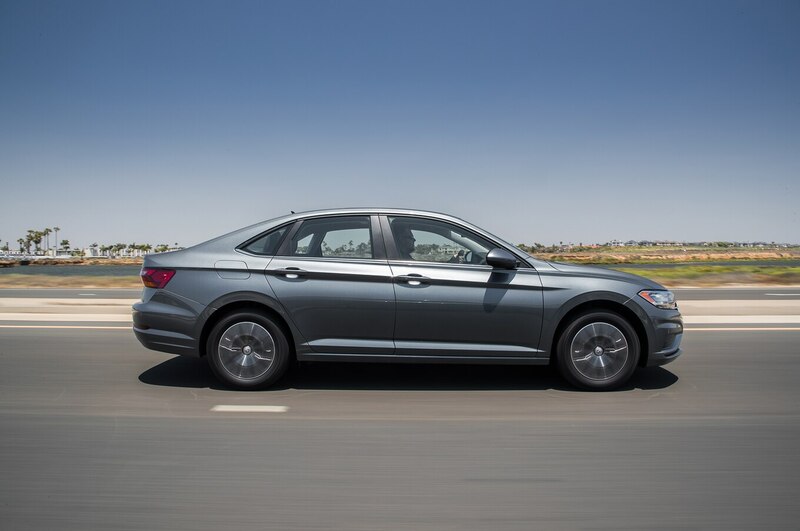 And at this price range, the spacious and also efficient Honda includes features not found on the Jetta SE, including a second USB outlet, rear-seat air vents, an eight-speaker sound system (the Jetta SE gets four speakers), and the helpful auto brake-hold feature. The Civic’s auto brake-hold systems holds the brakes for you when you’re stopped, automatically releasing the brake when you touch the accelerator pedal. 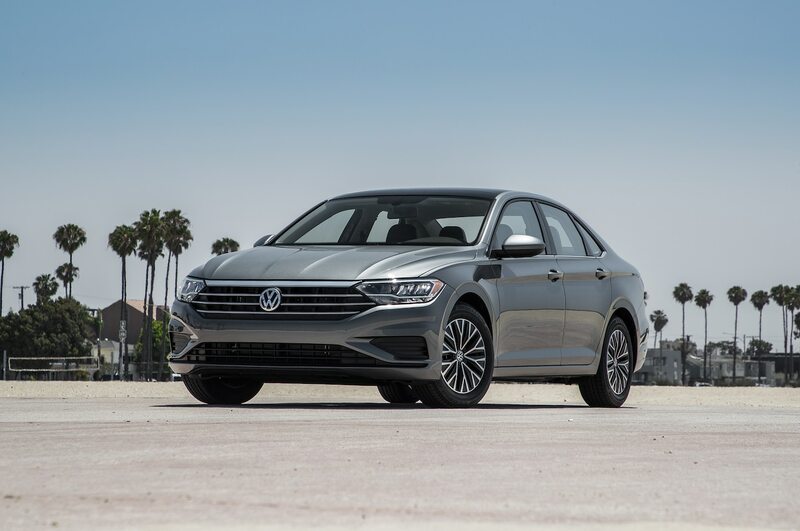 If you’ve already crossed off your list heavily discounted compacts, consider the 2019 Jetta in the SEL non-Premium trim. 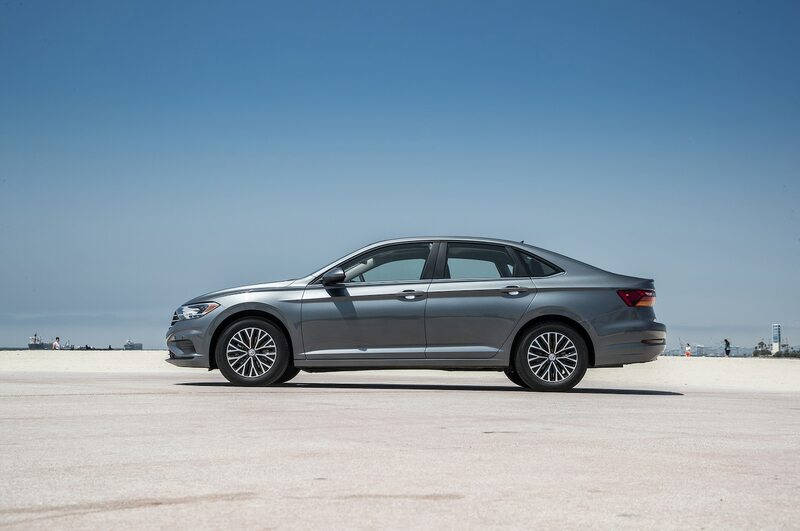 The Jetta SEL trim adds a 10.3-inch digital instrument cluster like nothing in its class—I spent a year in an Audi A4 with a similar system and miss the cool tech. The extra $2,270 USD from SE to SEL also gets you 10-color ambient lighting, a larger touchscreen with a second USB, a CD player (Spotify and Apple Music don’t have everything), adaptive cruise control, lane keeping assist, and a 400-watt eight-speaker sound system. 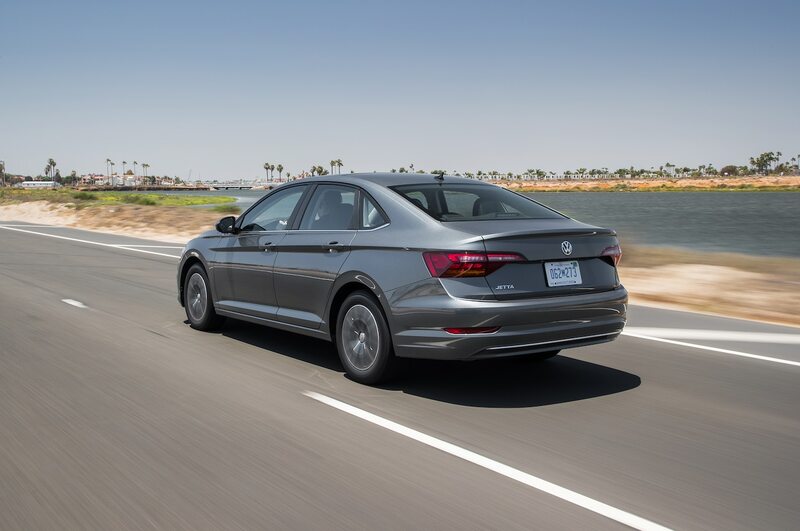 In SEL form, the Jetta is a quick and spacious compact with a killer warranty, neat cabin tech, and a touchscreen that smartly faces the driver. 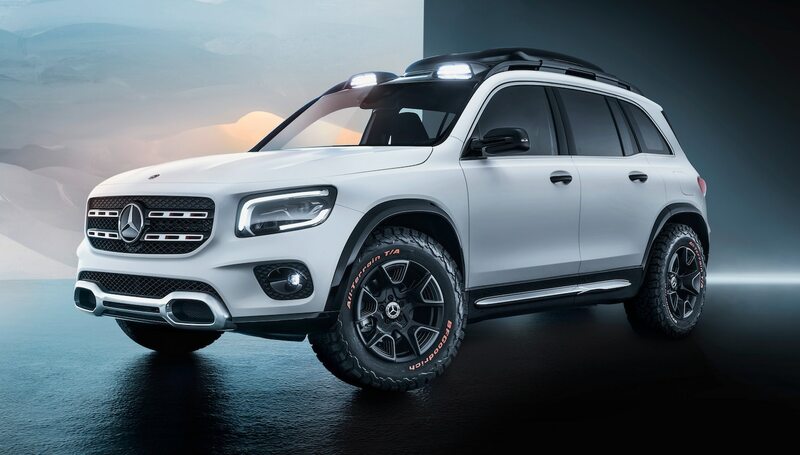 The cabin doesn’t have universally high-quality materials, but that’s why you’re considering Volkswagens and Hondas instead of Audis and Mercedes. 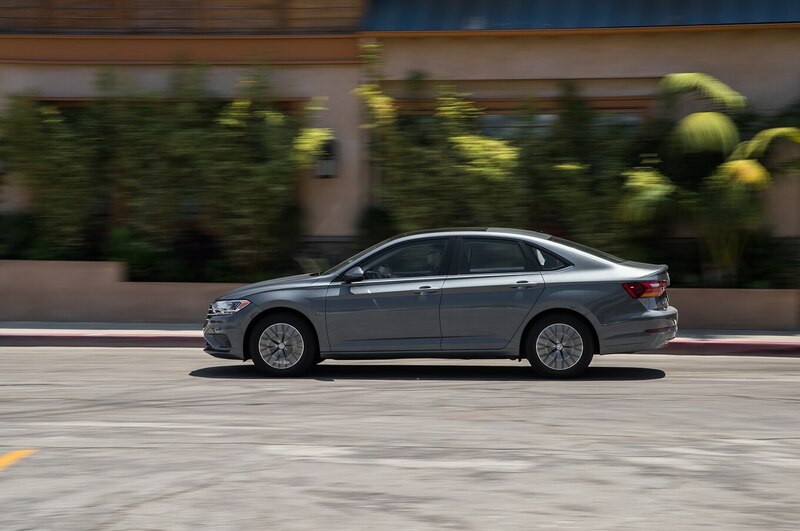 If driving a good car is still a priority to you in a compact-sedan class full of discounted options, add the Jetta to your list beside the Civic.